Make your own valentines with these printable holiday cards. Celebrate Valentine's Day and make your own valentines this February. Travel back to the Jurassic Period with this printable dinosaur set! 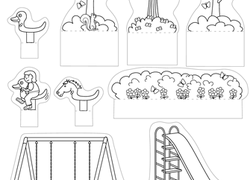 Your little adventurer will love to colour and cut out these ferocious friends. Valentine's Day rolling around again? Make things a little easier by printing your own valentines. Your child will love handing out these cute cards. Celebrate your progress over 100 days of school with this paper quilt project, creating one square for every school day so far! Kids can make their own unique pop-up park complete with swing set, slide, and critter-filled trees with this cute year 2 arts and crafts printable. Prepare your kid to take off on a new reading adventure with these space-themed bookmarks that are truly out of this world. Create your very own constellation chart with this cut-out template, perfect for stargazing on a clear night! 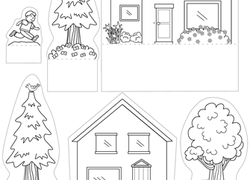 With this printable your child can create a pop-up neighbourhood complete with houses, trees, and a mini pop-up boy! 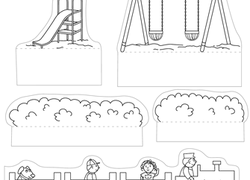 Create a miniature pop-up playground with your first grader with this fun printable that comes complete with swing set, slide, train, and pop-up children! Valentine's cards for boys take some of the sweetness out of the card exchange. Print out a set of Valentine's cards for boys with your child. 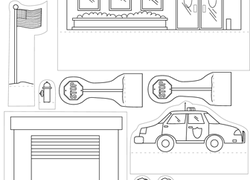 Kids create their own unique pop-up paper police station complete with buildings, police car, and police dog with this fun year 2 arts and crafts printable. 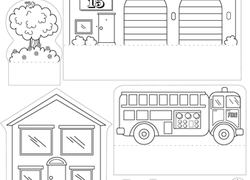 Your child can create his own miniature pop-up neighbourhood complete with fire station, fire truck, and all with this fun printable. Your child will love coloring and decorating these butterfly valentines. Add a lollipop for the butterfly's head to create an extra-sweet treat! Test anxiety can be a huge blockade for many kids during their education. Help your child relax for his next test with these helpful strategies.